Dot was without a doubt the quietest and most patient pet we have ever encountered here at The M.A.D. house Artists. 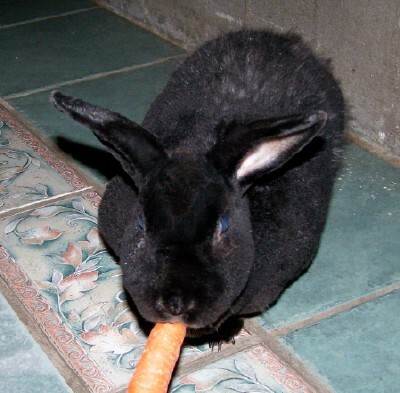 'Why November for the Bunny to be Cute Furry/feathered Creature of the Month? ', you might ask. Dot belonged to Mink, and November is the month of Mink's birthday. 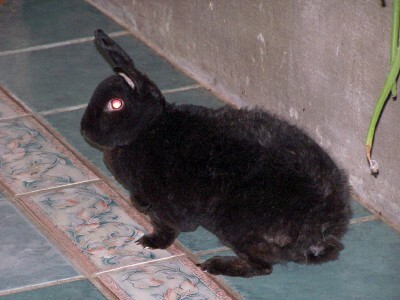 Naturally, she demanded that we find a bunny in November...as the 'bunny' season is usually a bit closer to Easter. But not our Mink. Had to have a bunny in November. 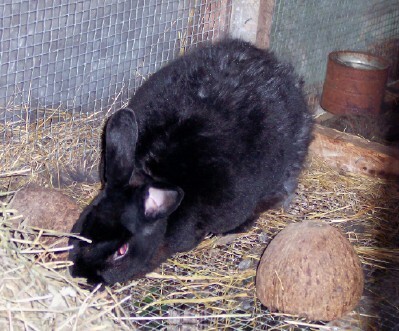 Dot was the second beloved bunny for Mink, Sugar was the first about ten years ago. 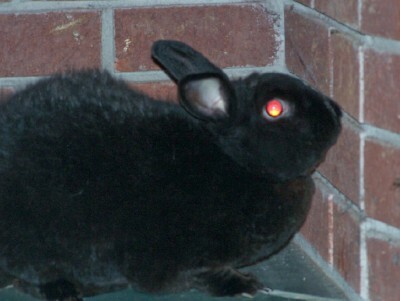 Dot was part Rex, which made his fur extra soft. 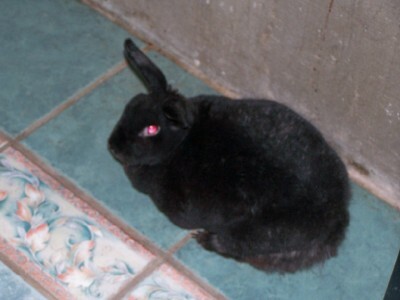 As a baby bunny, Dot lived inside in the upstairs bathroom until he ate the plastic water feed to the bidet. The plumber is still laughing about that one. 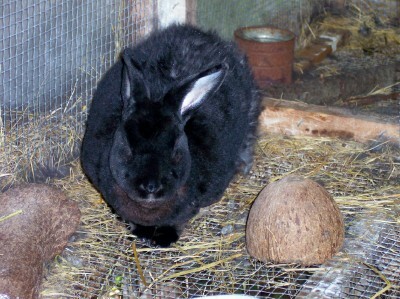 Summer found Dot out in his hutch with a sprinkler on top for natural water cooling, special quilted bunny-blankets and a trouble-light for the winter, and in the deepest cold he was always welcomed back into the house. Mink has provided us with a nice number of images of Dot inside his house and out, and she would like to invite you on a brief tour of his world. We will miss him. 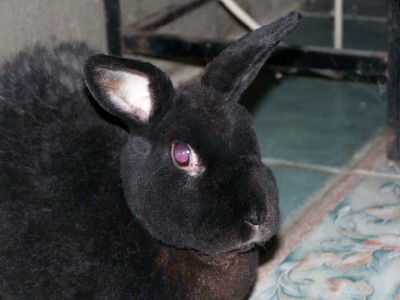 Thank you, Dot, for eight years of your quiet presence in our family. 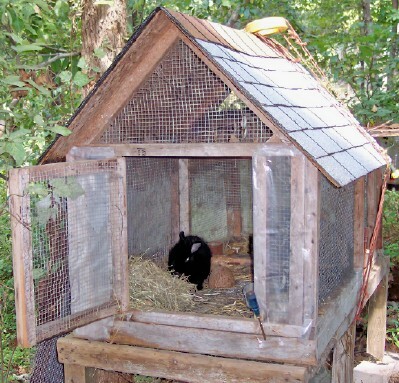 This was Dot's Bunny Hutch. He had a neighbor in the right half of the house, but she passed on in 2006. 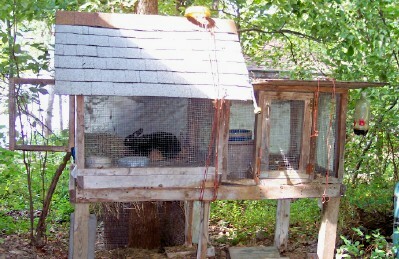 Until his passing, October 20th, 2008, Dot had the run of the whole hutch, through a small door in the middle. Hi! Come in! Want a bite of hay? This is Minyard's best! Whoa. The kitchen tile is a bit slippery, I had better watch my step. Safe at home again. Come by and visit again soon!